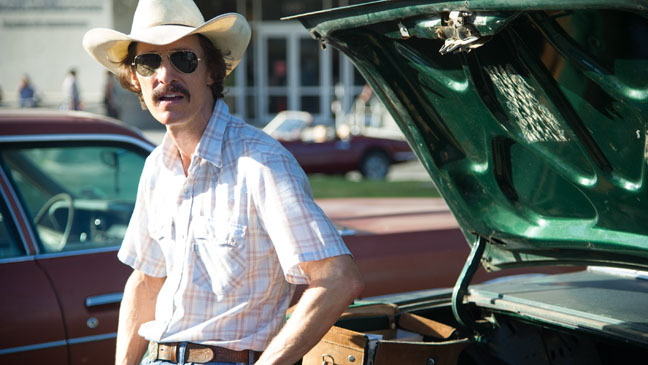 Dallas Buyers Club isn’t just about this true life homophobe turning ally, though. Woodroof’s ostracization from his straight guy friends soon takes a backseat to his crusade against the FDA over AZT, a Big Pharma drug used to treat AIDS that actually made it worse for many people during trials. Along with Rayvon (Leto), a transgender woman he meets in the hospital, he forms the “club” that gives the movie its title to give unapproved-but-effective drugs to AIDS patients. Rayvon and Woodroof aren’t allowed to directly sell those medications, but they can give them away to members of their organization. Those people pay $400 a month for access to drugs Woodruff smuggles in from Mexico, Japan and other locales. He of course butts heads with government officials and local doctors who are paid to push AZT. This gives the ’80s AIDS crisis a narrow, human story to rip it away from broader headlines. Jean-Marc Vallée avoids easy melodrama in favor of near-constant narrative and visual momentum. When Woodroof isn’t forcibly stopped by a hospital stay he is a dizzying whirlwind of motion. He hops across the Texas/Mexico border and around the world to subvert FDA loopholes while trying to convince people (namely an attractive doctor played by Jennifer Garner) that what he’s doing is for the better. Despite the thrilling premise and a pair of heartbreaking performances, Dallas Buyers Club was still quite a difficult movie to love. It is yet another issue movie told through the lens of a straight white guy, absent crucial political specificity and made for mass appeal. The AIDS crisis of that time instilled widespread fear in the country and around the world, but its impact on the gay community was unparalleled. Of course the movie does touch on that, but it felt wrong to me to give nearly all the attention to a man who changed his mind about us because of the disease. The movie occasionally won me over in the end despite those issues, though. It’s made without the heavy-handedness of most studio message dramas, and never overindulges in homophobia for a laugh or exploits the suffering of the disease for an easy cry. For the most part Vallée’s decision to cut away during those emotional outbursts was a good one to keep the movie going. However, as the inevitability of death continues to circle the main characters, I wish it had gone in for a closer look. This is especially true of Rayvon, who is given precious few moments to shine on her own. Would the movie have been made and released by a major studio if she had? This entry was posted in Reviews and tagged 1980s AIDS, AIDS, AIDS crisis, AZT drug, Best performances of 2013, Dallas Buyers Club, Dallas Buyers Club review, Jared Leto, Jean-Marc Vallee, Jennifer Garner, LGBTQ, Matthew McConaughey, Matthew McConaughey weight loss, Trans* advocacy, Transexual, Transgender, Transgender discrimination by matterspamer. Bookmark the permalink.